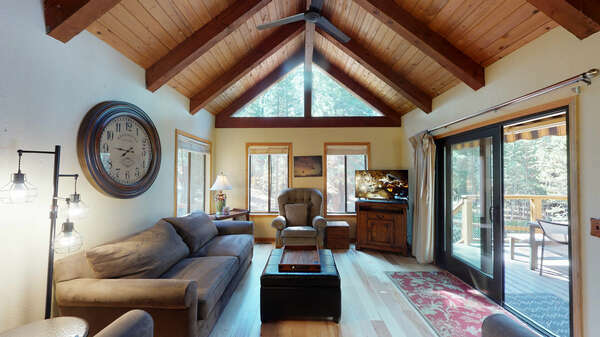 Our beautiful Sweetbriar garden unit on Lake Tahoe's North Shore will quickly become your favorite go to vacation home in North Lake Tahoe. The complex is located at the bottom of HWY 267 and on Lake Tahoe's sandy beaches. The location is the best as you are right on the water in the summer and within only 10 min drive to Northstar, and if you don't like to drive in the winter, just take the shuttle that stops across the street. Walk to shops, restaurants, grocery store, golf course and much more. Our Sweetbriar Garden Unit is located on the second floor with partial lake views from the living room and deck. As you enter the condo you'll be welcomed by an warm and open living space, enjoy a book by the fireplace or have a glass of wine on the deck, the little ones will love playing on the grass or on the beach, this is a very relaxing, family oriented complex where you can unwind and enjoy Lake Tahoe's beauty. Off of the living area you'll find 2 bedrooms with queen size beds and 2 full bathrooms. Either you're coming on an active weekend or on an relaxing one, Sweetbriar is the place to stay at when vacationing in Lake Tahoe.